This Thursday, February 7, 2008 is the Lunar New Year. In Viet Nam, it is also known as Tết Nguyên Đán, Tết Ta, Tết Âm Lịch, or simply Tết and it is the most special and greatest annual celebration in our culture. It is a time for us to clean our homes in preparation for the new year, decorate our altars and pay our respects to our late ancestors, wish our friends and family a healthy, prosperous new year, buy and display flowers and kumquat trees, and make and eat copious amounts of food (with somewhat reckless abandon, in my case) to ensure good luck and prosperity for the future. For me, it is much like Thanksgiving, All Souls Day, Christmas and New Year’s all rolled into one big holiday — and plus, plus we get money (lì xì) in little red envelopes! Truly, it doesn’t get much better than that. Tết would not be what it is without Bánh chưng. 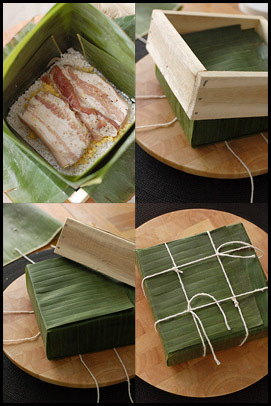 It is a savory cake normally consisting of glutinous rice, yellow mung beans and pork bundled together with banana leaves into a square. You can read a brief note about its origin here. Despite living not far from Little Saigon in Orange County and therefore, having plenty of options for buying Bánh chưng from the shops that line Bolsa Avenue, my mother always made hers. While there are plenty of quality cakes to be found, it’s still somewhat of a gamble as you cannot be certain if a cake is good or not until you cut into it. So every year, my mom will set out to get her fresh pork belly (thịt ba chỉ) and the rest of the ingredients at the Vietnamese market. A day before assembling the cakes, she’ll prepare and season the pork belly with salt/fish sauce, pepper and shallots. Next, she’ll soak the glutinous rice and the mung beans. The following day, she’ll drain the rice and mung beans, wash the banana leaves and prepare her mise en place – which is set atop a clean bamboo mat on our ceramic floor. With a lovely wooden square mold that my cousin Anh Vĩnh made for her, she’ll assemble her cakes and boil them in a large pot that she sets over a large gas burner outside in our yard. We’ll keep a distant watch while it boils for at least 7-8 hours, the fragrant smell of banana leaves wafting in the air, through our windows and into our home. It always seemed to take an eternity to cook the cakes and we could hardly wait to dig into a fresh, warm cake. The day before you assemble the cakes, cut and season the pork belly with the fish sauce, shallots and black pepper. Cover and refrigerate. The night before, soak the rice and mung beans (separately) in cold water. On the day of – prepare your wrapping station/mise en place: Defrost the banana leaves by soaking them in hot water and rinsing them thoroughly. Cut them into the aforementioned sizes. Cut the twine. Drain the rice and mung beans (always keeping them separate). Season the rice with 2.5 Tbl. (~38 g) salt – set aside. Season the mung means with the remainder 1.5 Tbl. (~22 g) salt – set aside. Top the pork with another 1/3 cup (~75g) of mung beans and top them with a heaping 1/2 cup (~150g) of rice. Smooth the top layer of rice (add a few tsp. of rice if necessary to form an even layer of rice). Top the rice with the square leaf (shiny side down) and using the palm of your hand, press down gently to evenly compress the ingredients. Fold the corner leaves like you would a gift box top/bottom, starting with one side and following with the opposite side. Gently press again to make sure everything is nicely compressed (don’t press too hard, though). Once the corner leaves are folded flat, gently, but firmly fold in and overlap the 4 outside, base leaves. You should have a completely enclosed cake. To ensure a better seal, wrap the entire cake in aluminum foil. When finished, flip the cake, turn it 90° and repeat with another layer of foil. Loosely tie with twine. Repeat with the rest of the cakes. Take all the banana leaf scraps and toss them into the bottom of the pot. This is thought to help prevent the bottom cakes from getting scorched. Tie two or three cakes together and stack them (standing up) inside your pan. Place a large, heavy plate or a shallow pan on top of the cakes (this is to weigh them down, as they will float at the beginning). Add enough water to fully cover all the cakes and set the pot on medium heat (uncovered) until it begins to boil. Gently boil for approximately 8 hours. You may need to replenish the pot with additional boiling water from time to time. Edit: I’ve been told by a certain mother that I over-crowded the cakes inside the pan a bit (see below). They should cook standing up but not squeezed in so tight – as the rice needs room to expand. At at the half-way point (after 4 hours of boiling) – carefully take the cakes out and rotate them so that all the sides cook evenly. When the cakes have finished cooking, gently and carefully remove them from the pot. Line them up next to each other (large, flat side down) and cover with a large cutting board or cookie sheet. Weigh them down by placing a heavy pot or several large food cans. Once cooled, remove the foil and twine and wipe down all the sides of the cake with a clean rag/dish towel – do this with all the cakes. At this point, you can fully unwrap and enjoy them. Peel and pull back the banana leaves and cut the cake with thin wire or unscented dental floss (as you would a cheesecake, for example). With the rest, cover with plastic wrap. We usually wrap them in plastic and tie them with red ribbon to gift to others and for placing on our altar. The cakes will keep refrigerated for about a week. They can also be frozen. Then, when you want to eat them, defrost and steam for about 20-30 minutes. These are often enjoyed with pickled baby leeks/spring onion bulbs/shallots (củ kiệu) or with pungent daikon and carrot pickles (dưa món). You can also cut them into 3/4 inch (2cm) thick slices and pan-fry them until golden for a crispy treat. You are my hero!!! You are a ROCKSTAR! My grandma makes something similar, but they are wrapped in a sort of funky double-ended triangle shape (Chinese zong-tse). We use lotus leaves (I think it’s lotus – see how lame I am!?) and glutinous rice and fill with either sweet or savory fillings. Mmmm. Good times! I love your step by step and of course, yours are far more beautiful than anything I’ve ever eaten. Forget about buying a house, you and Pierre can come live in our guest floor 🙂 Hope your New Year’s preps are going well. I can only imagine what a bash you’re preparing! This is fantastic! I love banh chung. I haven’t found a good place to buy banh trung in the Bay Area yet. When I do see it, I’m reluctant to buy it because I don’t know how long it’s been sitting on the counter. It’s funny, my actual banh chung supplier is in Orlando where my parents live. My folks order them from a woman, who makes them out of her house. So, when I visit my parents, I’m always lugging back banh chung from Orlando to San Francisco. I have never tried to make it, but now with your Jen-style instructions, I think I’ll have to give it a try one of these days. Thanks! Holy moly, Holy B. ! Great instructions, hopefully it will get people to make their own banh chung. It’s really worth the effort because not only is it cheaper, it’s fresher too. Like Chuck brought up, ya never know how old those banh chung have been on the counter. When I’m in a bind and end up buying it, I’m taking a $12 chance . Ouch !! Jen – do you know what a loud snorer Pierre is??? 🙂 No, I’m kidding. You know, I’m not sure, but I think I remember seeing Ming Tsai’s mother make the triangular cakes you mention. And of course, she did it all free-hand, with no frame/mold. My friend Bing told me about the ones she’s had – with chestnut/lotus seed fillings, red bead filling… it all sounds lovely. You know, if we were neighbors, I would probably borrow much more than a cup of sugar – like half of your amazing dishes! Chuck – This was my first time to make these cakes completely on my own and I’m rather pleased with the look and taste of them. I also used to bring these back after a visit back home. I’d freeze them and they reheated quite nicely. It’s not too late to make your own for this New Year! If you do, let me know how yours turn out. I love it! And I especially love learning how you celebrate your new year. Your family is going to be so proud of you! Lucky them! Mich- I’d be happy to give you a bánh chưng – where are you at? But you’ll have to tell me how to shape bánh tét! We have similar called ZongZi in triangle shape like Jen mentioned. My mom uses Bamboo leaves to wrap, which I regard ‘highly technical’. However, it’s traditionally eaten during Dragon Boat Festival (Duan Wu). I will share the Chinese BÁNH CHƯNG with you one day! Mycookinghut – Oh, that would be awesome – I’d love to learn how to shape those triangle cakes! When is Duan Wu? I can’t wait! Anh – bánh chưng with cá kho? No, I’ve never tried it but it sounds interesting…I might try that soon. This is seriously the best food blog post EVER! Do you like to add peanuts (without the skins) and black beans in your’s too? we are waiting to your reply. bạn ơi cho hỏi bánh chưng gói bằng giấy bạc ăn có độc không? Christine, I enjoyed reading about the history and was fascinated by your step by step descriptions and photos. What a patient, loving process … and I can’t wait to dig in! Have no ideas what to serve with it! Maybe pickles and chacuterie?! (I won’t even hazard a guess where I can get the daikon and carrot pickles)! « Who You Callin’ Eggroll?